Mahamahopadhyaya Pt. Ramavatar Sharma (born 1877) was a genius of very high order. He had a brilliant career as a student of Sanskrit in which he earned the oriental degrees of Kavyatirtha, Vyakarancarya, Sahityacarya etc., having received his education under the guidance of his father at an early stage and later under the tutorship of the famous Pandit Mm Gangadhar Shastri of Queen’s College, Benares. He also had his education in modern subjects in English and passed all his examinations from Entrance up to M.A., having topped and received prizes in most of them. Mm Ramavatar Sharma held many prestigious position, appointments and assignments in the academic profession of the early ninetees, including Principalship of the Oriental College of B.H.U. His scholarship was widely recognized and the Government of India conferred on him in 1919 the title of Mahamahopadhyaya, the highest official honour in the field of Sanskrit learning. He taught Sanskrit mainly at Benares and Patna and held the post of Professor and Head of the Sanskrit Department in Patna College till his death on April 3, 1929. Pt. Ramavatar Sharma was equally brilliant and also original as author. He wrote and spoke Sanskrit, Hindi and English with equal ease and authority. He wrote articles and books on Philosophy. He wrote articles and books on Philosophy—Indian and Western, Philology, Grammer, Poetry, Sanskrit Literature, Dharmasastra etc. and his literary career culminated in the production of the present work Paramarthadarsana in the ancient Sutra style, which rightfully claims to be the seventh system in addition to the Saddarsanas of the Six Classical (Vedic) Systems of Indian Philosophy. The work begins with a discussion of the purpose of Philosophy or Darasana, which is basically to promote rational belief and action, criticise errors and illusions and point the way to liberation. In brief the purpose of Philosophy is to elucidate the nature of reality or Paramartha. 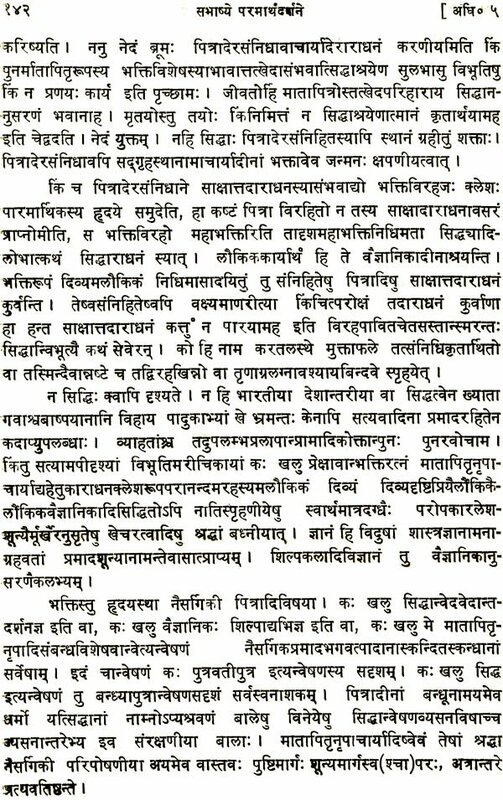 While the author does not uphold the traditional distinction of Paramartha and Vyavahara, he does make a crucial distinction between Jnana and Vijnana, wisdom and Science. Paramartha is defined as what is uncontradicted, and determined on the basis of uncontradicted perception, inference and command of authentic persons. Pratyaksa, anumana and Sabda are accepted as three Pramanas. The role of Sabda is confined to a knowledge of practical norms. These are briefly the contents of the First of the Seven chapters into which the work is divided. The second chapter is largely devoted to a scientific description of the consmos and of the evolution of life culminating in man. In the Third Chapter the need of synthesis of Jnana, Karma and Bhakti is defined as disinterested love illustrated by the parent-child relationship. The Fourth Chapter begins with an exposition of Karman and the Fifth with the consideration of pure knowledge. 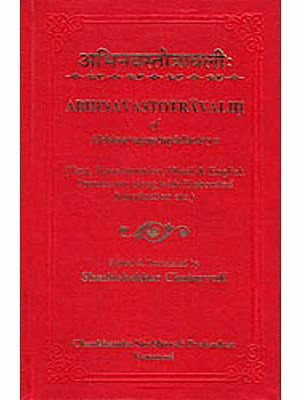 The Sixth Chapter is devoted largely to a critique of the Vaisesika categories and the Seventh is a kind of Appendix mentioning some views of others and many standard examples and anecdotes presupposed by them. If we reflect on the overall character of the philosophy expounded in the Paramarthadarsana, its striking originality and modernity would be clearly evident. It could well be considered as secular philosophical wisdom. The role of philosophy is to enlighten men rationally. Divorced from religious preconceptions, this conception of philosophy is essentially modern. This small volume on Vedantism is mainly based on the Sree Gopal Basu Mallik Lectures delivered by me at the Senate House, Calcutta, during the Session 1907-1908. The order and the titles of the Chapters in this book somewhat differ from those of the Lectures as delivered. But the substance of both is identical, and the difference in the form is due only to an effort to make the book readable. Vedsntism has been treated here as a critical system of thought that it really is, and not as a dogmatic mixture of cosmology and eschatology that it has been fancied to be by many recent writers on the subject. While Mm Ramavatara Sarma is well known to traditional scholars of Sanskrit as a versatile scholar, unorthodox thinker, social re- former and satirist, few modern scholars are aware that he was an original, critical and modern philosopher who nevertheless wrote down his philosophical magnum opus in chaste, classical Sanskrit. He was far more radical than Dayananda, rejecting much of the ancient tradition as mere superstition. This rejection of cherished religious beliefs from a purely rational standpoint did not endear him to traditional scholars. As a senior contemporary of Mm Gopinath Kaviraj he furnished a polar contrast to him. Kaviraj was apt to discover some profound meaning or truth in Pursnes and Tantras and in the legends of siddhas. Ramavatara believed all these to benot merely false but pernicious. Despite his background and formal training in the ancient Sastras, he was a profound admirer, like Rammohun Roy, of modern science and rational philosophy. Unlike Rammohun he laid little store by any traditional religion. Despite being one of the most original and systematic philosophers of modem India, he remains little known to the modem philosophers of India because of his choice of Sanskrit as the medium of his most important writings. These writings have, indeed, remained largely inaccessible. The present publication of his Paramarthainusasana-sutrani would make his magnum opus available to scholars for the first time. It has been said that Ramavatara Sarma produced the Seventh School of Indian Philosophy. He certainly produced a new and original system of philosophy which was in part developed through the criticism and interpretation of traditional Indian schools. In this sense perhaps his system could be called a new Indian system but it is Singularly free of most purely Indian religious or cultural presuppositions though his language and idiom are certainly classical. On the whole, he is perhaps nearest to non-dualistic Vedanta minus its religion, theology and asceticism. On the other hand, his rejection of religious beliefs about soul, God, afterlife and ritual earned him the soubriquet of being a Neo-Carvaka. But he is no more a Carvaka than was Vallabha or Green. Mm Ramavatara Sarma was born in the Chhapra district in Bihar in 1877. It was the heyday of the British empire in India. A series of economic, social and educational changes were overtaking and transforming tradtiona1 Indian civilization. A purely rura1 agrarian society was gradually but irreversibly beginning to enter the age of industrialization and urbanization. With its long-term revolutionary destabilization, traditional caste-based social hierarchies and roles, the ritualized mode of social action and relations, and the feudal despotic modes of governance were being slowly but surely replaced by economic classes, contractual relations and rational-bureaucratic control. Education based on classical languages, theology, faith and scholasticism was yielding place to modem Western education which encouraged scepticism, rationalism and science. This process of modernization was bound to have a revolutionary impact on the intellectual climate of India, and several different kinds of modernizers were produced. There were those who proposed a synthesis of traditional and modem ideas in diverse ways. Raja Rammohun Roy and Ishwar Chandra Vidyasagar, Vivekananda and Aurobindo, Tilak and Gandhi may be mentioned to illustrate this trend. There were those who had little sympathy with tradition and wanted a thoroughgoing modernization such as M.N. Roy and Nehru. Although traditional Panditas were normally orthodox, there were some who proposed large-scale rejection of traditional opinions and values. Dayananda is the best known of such thinkers but his iconociasm was of the traditional mould and he clearly followed one of the Six Schools of Philosophy. He was untouched by the modem intellectual idiom or its new secular scientific ideology. Pt. Ramavatara Sarma represents a nearly unique example of a modernizer who remained a traditional Pandita not only in his basic education but also in his language and style of writing. He wrote in Sanskrit in the traditional style of aphorism and commentary but nevertheless poured new wine in old bottles. Behind the battlements of classical form, Ramavatara Sarma was a thoroughly modem man in his ideas. Although born in a high class Brahmana family and educated on traditional lines, Ramavatara Sarma studied the English language on his own and acquired high proficiency in modern scientific and philosophical thought. After a distinguished career as professor in Patna College he passed away in 1929. Among his English writings the most important are his Sri Gopal Basu Mullik Lectures on Vedanta and Chapters From Indian Philosophy. His writings in Hindi include accounts of European philosophy and Indian history. But it is in his Sanskrit writings that one can recognize his true stature. He was an accomplished poet and stylist who wrote with sparkling lucidity, humour and wit, a scholar who carried his scholarship lightly and a philosopher who -cared only for truth. Of his many works in Sanskrit the Paramartha-darsanam remains his magnum opus. The work was published in essential outline in 1913 but became out of print and unavailable soon. The author also wrote a substantial commentary on the work which was taken up for publication a long time after his death but that too is no longer available. It is, therefore, a matter of gratification that the work is now at last being published suitably. Before proceeding to a systematic consideration of the work, it may be well to place the author within the Indian tradition. Two streams can be discerned within the Indian tradition, orthodox and heterodox. The former relying on the Vedas has developed their ideas rationally in a number of philosophical systems of which the Nyaya, Mimamsa and Vedanta are the most prominent. The heterodox stream includes the materialist, Buddhist and Jaina thought. The Sankhya too originally appears to have been heterodox and Yoga was closely connected with it. The critical rational- ism of heterodoxy led it to reject the authority of the Vedas, theism and ritualism, and in some cases to reject the idea of the soul also. However, except for the Carvakas, heterodoxy too continued to believe in the doctrines of Karman, rebrith and various immaterial worlds and gods. Belief in Yoga and miraculous powers was also common to both the streams. The materialists-the Carvakas or the Lokayatikas-however, rejected all transcendent entities. They could be called the extreme or radical branch of heterodoxy. Although Ramavatara Sarma was not a materialist, his heterodoxy could certainly be described as radical. In his radicalism he was not uninfluenced by the rationalist character of modern philosophy, though its influence is so thoroughly absorbed and synthesized with the traditional mode of philosophizing that it is not easily discernible. For Ramavatara Sarma the central theme of Indian philosophy has been the question of the unity of being or experience. The unity of Nature" perhaps vaguely present to the prehistoric instinct, had been easily lost with the advance of the logical capacity of man. Through the influence of the Upanisadic teachings this unity of Nature, including both the subjective and objective worlds", was recovered and transformed into a critical and rational Perfection. It is with respect to this theme of unity that the history of Indian philosophy can be understood. The Sankhyan dualism of the subject and the object made the recovery of the original unity difficult. The Carvakas "rejected the subject altogether and recognized the objective world as the sole reality and made the subject a mere property of the object. But the subject thus discarded often pressed itself upon thought and at last the scale was turned when Buddhism recognized the subjective principle alone and rejected the object altogether. When separated from each other neither the subject nor the object could keep its unity. Both were pulverised in turn." Buddhist subjective atomism was matched by the objective atomism of Kanada, "Thus alternately the subject and the object abstracted from the Saksin and losing their original unity were naturally pulverised." The Jainas offered a critical relativism which could not satisfy the human seeking for perfection and infinity. The Bhakti schools fancied this object of human desire to be an extra-mundane reality. Thus the "Dualism of the Sankhyas, the psychic atomism of Buddhism, the physical atomism of the logicians and the theology of the Paficaratras" may be regarded as the varied background in which Vedanta developed. It is in Vedanta that Ramavatara Sarma finds the highest development of Indian philosophy. His own metaphysics is close to Vedanta which he interprets in a startlingly original fashion, rejecting many of its traditional doctrines and interpretations. It is in his interpretation of Vedantic metaphysics that he is closest to modem idealistic absolutism though he differs from it greatly in his ethics. Knowledge is the starting point of Vedanta which seeks it as a concrete reality, not as a mere abstraction. Nor can psychic atomism be adequate to the understanding of knowledge. Psychic moments can only be elements of" the eternal, infinite, all-embracing, self-conscious spirit which finds itself in every momentary unit, connects these units, makes abstractions of them and, in short, constitutes them to be what they are." "The Permanent Being, the Saksin of all experience, is the concrete starting point of Vedantism."